Quest for better water quality includes understanding the health of life in our streams and rivers. If you are having a picnic or enjoying the banks of a New Zealand river or lake this summer and you are bothered by a mayfly, a stonefly or a caddisfly – be patient. These little insects are a vital part of healthy aquatic ecosystems and are therefore among the new measures of water quality in New Zealand, now being reported in the macroinvertebrate community index (MCI). The index has been compiled previously but was included for the first time in the report on 10-year trends in our waterways by Land Air Water Aotearoa (LAWA)* recently. The MCI showed 26 per cent of sites monitored were improving while 42 per cent were "likely or very likely degrading". Macroinvertebrates include insects, worms, and snails, important food sources for fish and many regard their health as a better measure – or at least an integrated measure – of the health of our waterways. Mayflies, stoneflies and caddisflies are more sensitive to pollution and tend to be more commonly found in clean and healthy streams. Worms and snails are more tolerant to degraded habitat conditions, surviving where others don't in streams of poor health. The mayfly (about 40 species of them ) lives anywhere from a few minutes to a couple of weeks as an adult, depending on the species. However, after hatching from an egg, the larval form lives for about a year, hiding during the day as they are keenly hunted by some fish. They like cool, clean, well-aerated waters as larvae and riparian vegetation as adults. The stonefly likes running water and boasts about 100 species in New Zealand. Some are carnivores and the nymphs live in water for 1-4 years, depending on the species, while the adults typically live for 2-3 weeks. The caddisfly is closely related to moths and butterflies, also have aquatic larvae and some, like the mayfly, many of both taxa consume algae, but some belong to different feeding groups. Caddisflies are one of the most diverse groups of organisms living in New Zealand's fresh waters with more than 250 species. The desirability of the larval stages of these insects is well understood by anglers who have developed lures resembling all three nymphs to catch trout. The MCI, developed to assess the impact of organic enrichment, is now being reported on by LAWA as one of the indicators used to monitor water quality. Others include water clarity, turbidity (cloudiness), E. coli, nitrogen, oxidised nitrogen, ammoniacal nitrogen and dissolved reactive phosphorus. 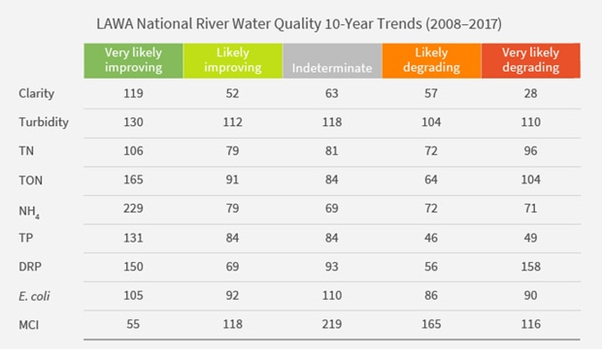 From 2007-2017, these indicators showed more rivers, lakes and streams were improving than getting worse across New Zealand. Macroinvertebrates and the MCI scores calculated from them are responsive to multiple environmental changes such as flow, habitat, temperature, water quality and sediment. LAWA river water quality head Tim Davie said when the report was released: "At the national level, for every parameter there are more sites showing signs of getting better than getting worse, except for the MCI trend which shows two out of five monitored sites are likely or very likely degrading. "Macroinvertebrates are a good indicator of the wider health of waterways and have a high ecological value, so it's disappointing to see they're under pressure. On the other hand, it's positive to see improving trends for the eight chemical-physical water quality indicators as we know these are quicker to respond to change." The macroinvertebrates are a key element of stream ecosystems; they feed on algae, aquatic plants, dead leaves and wood, or each other. While the larvae were food for native fish, when the insects matured and left the water they become food for birds, bats, and spiders. LAWA chair Stephen Woodhead said they hoped making the information freely available online would encourage more New Zealanders to get involved in freshwater management and support healthy waterways. "We know from previous research MCI is affected by human activity. Therefore, it's important we keep focused on reducing our impact on waterways."